"There are rumors in the air of many improvements contemplated along the Zayante. The great number of people who flock to our health-giving mountains is increasing yearly, and to provide adequately for their comfort and pleasure far-seeing men are going to erect new dwellings and provide camping grounds. "It is very strange that such a beautiful glen as that of the Zayante—lying at the very doors of the metropolis, San Jose and Santa Cruz, should have been so long passed over and neglected. When we have visited some of the so-called romantic resorts we have mused over what wayward subjects human kind are. When we see the trains passing by loaded with tired people looking for health and pleasure, it reminds us forcibly of rushing through Paradise and camping outside the gates. However, that is all over. The premonitory rumbles of our little boom are in the air, and Eccles will be no longer a mere flag station." 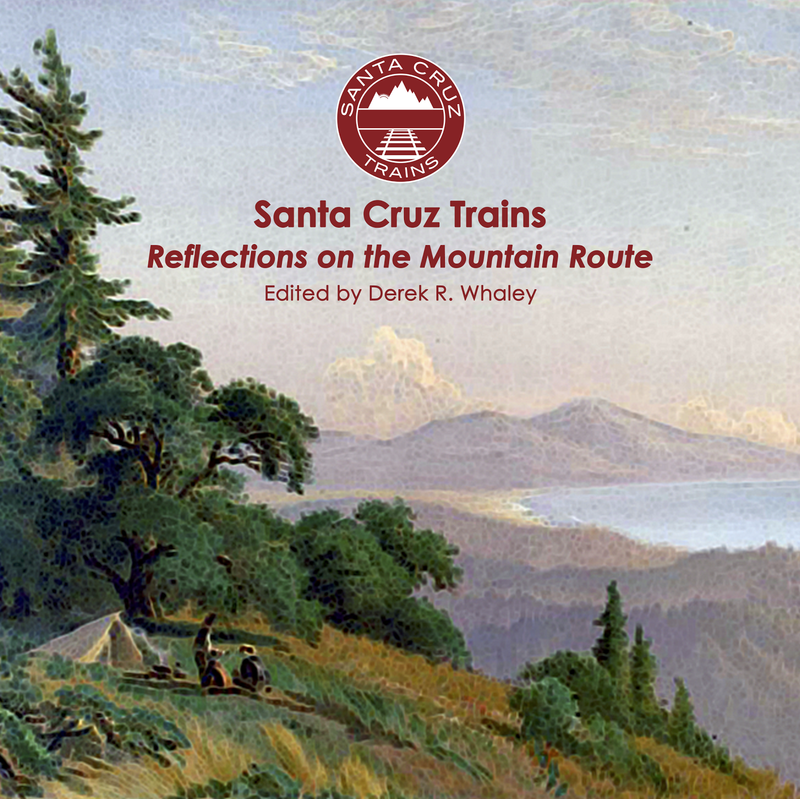 Here are some of the more successful resorts that sprang up in the Zayante Creek basin alongside the railroad route through the Santa Cruz Mountains. One of the earliest resorts in the area, Forde's Rest was probably founded in 1897 by William C. Forde near the confluence of Lompico and Zayante Creeks. As the photograph above shows, it had a rather luxurious portico that ran alongside the front of its cottages. Advertisements at the time noted as features trout fishing, bathing, hiking through the redwoods, and picnicking through picturesque wilderness. By the 1940s, the resort included 33 cabins, a 50 by 25-foot swimming pool, badminton and archery facilities, a recreation hall, and a restaurant. The Forde family ran the resort for nearly fifty years before selling it to John A. Cummins around 1944. He built numerous improvements but ended up selling the property to Jack A. Meisenbach in 1946, who continued operating the resort with his wife, Cordella. In 1951, Ivan and Mabel Netoff, owners of the Beach Hill Dining Room, purchased the property and renamed it the Vagabond Lodge, converting the entire property into a restaurant. This business appears to have failed within a few years and all mention of Forde's Rest and the Vagabond Lodge disappear from records. 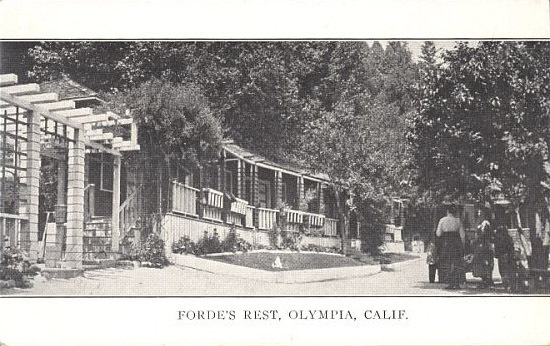 Established by William C. Forde immediately beside his Forde's Rest resort, Camp Olympia was originally a low-budget campground for those wishing to spend a few nights under the oak trees that flanked Zayante Creek. Advertisements in 1900 noted that campers should bring their own tents and noted activities such as "shady walks, bathing in limpid streams. Games, dance floor, hunting, fishing." In May 1901, the Young Men's Christian Association (YMCA) of California leased the property for a successful retreat that summer. The retreat was heavily advertised between 1903 and 1905, but marketing for it mostly disappeared thereafter. In 1912, an advertisement in the San Francisco Chronicle still noted that people can "Come and pitch your tent under the most magnificent oaks in the state. Tents and cots furnished. Bathing, fishing, dancing, pianola music." Yet it remained under-advertised and probably just a satellite of Forde's Rest. Nonetheless, the flag-stop that had been established for it remained in place and eventually replaced Eccles as the primary stop for the area, undoubtedly under the encouragement of Forde, who served as postmaster at Eccles and died only a year before the post office moved to Olympia. Our Ranch was founded around 1913 by Benjamin G. Marcum (or Markham) and his wife on a property between the railroad tracks and Zayante Creek near Olympia Station. Unlike the other resorts in the area, Our Ranch remained throughout its existence a full-fledged farm, selling products to local businesses, tourists, and locals. Throughout the late 1910s and early 1920s, the resort evolved into a popular dude ranch that attracted visitors from around the Bay Area. To attract customers, Zayante Creek was dammed just south of its confluence with Lompico Creek and a swimming and boating pool was created. Nearby, a dancing pavilion and restaurant were built to support guests. In 1926, plans were initiated to parcel off the portion of the property that ran along the railroad tracks between Eccles and Olympia, but this subdivision was never built for some reason. The second generation of management under Audrey Marcum made the location popular for school dances and community events, ensuring its continued use into the 1930s. During the Depression years, Our Ranch advertised its bed-and-breakfast appeal with its catch phrase: "All the milk you can drink. Oooooh! What a Good Meal!" By the late 1930s, the resort transitioned from a dude ranch to more of an event venue and restaurant, specializing in ranch-style Sunday roasts and chicken and turkey dinners. The family sold the property in 1939, but it was maintained as a restaurant for many years afterwards by Ralph H. and Anna M. Souders. Although Our Ranch did not suffer heavily from the 1940 storm that destroyed the railroad route, the Trout Farm, located directly across from Our Ranch, was destroyed and was not rebuilt until 1942. In 1941, the post office relocated to the Our Ranch store since there was no longer any need for the office to sit beside the railroad tracks. John Hall and his wife took over the property in 1948 and continued to operate the restaurant. By this time, virtually all of the original Marcum property had been parcelled and only the family home and restaurant, located on one acre across East Zayante Road from the fire station, remained. The home went on the market in 1953 but continued to appear regularly in advertisements, suggesting it was not saleable. The last mention of the property in newspapers is 1964, at which time it was for sale once again. 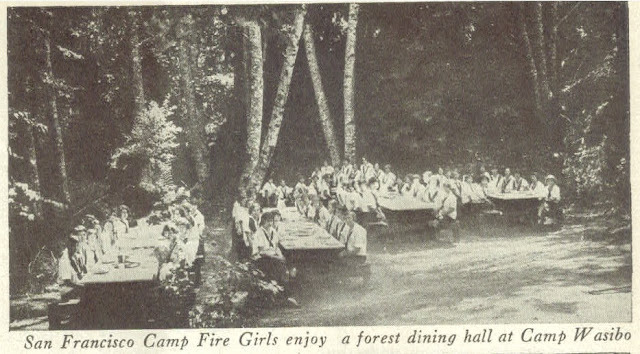 One of the last retreats built during railroading days, Camp Wasibo was operated by the Camp Fire Girls of San Francisco around 1925. The site, owned by the Ley family of Felton, gained popularity as a cheap vacation destination during the Depression and war years. From mid-June to mid-August of each year, Camp Fire Girls used the camp for extended retreats. It offered many activities including handicraft, weaving, nature lore, drama, outdoor cooking, canoeing, hiking, swimming, and archery. Weekly field trips visited local sights and took campers to Felton and Santa Cruz for shopping and recreation. During World War II, the camp ran four two-week retreats for girls. The Camp Fire Girls abandoned the site in 1948 but the Girl Scouts of America leased it by 1954 (possibly earlier) for use by their older campers, aged 10-16 (younger campers went to parks elsewhere in the county). Although the Girl Scouts signed a five-year lease, the torrential rains and severe flooding of 1955 destroyed the site and it was never rehabilitated. It remains unclear where precisely Camp Wasibo was located. One of the lesser known vacation resorts in the Zayante was named Ferndale, owned by Albert M. Mannell and his wife, Nellie May. For around two decades, the home hosted small numbers of visitors in a bed-and-breakfast style. The home also hosted local events and dinners, such as for the Olympia Whist Club. In 1931, the Mannell's upgraded the property into a full resort, building log cabins, cottages, and tents for guests. The property also included showers and a dance hall. In January 1936, the Olympia branch of the Townsend Society built a clubhouse on the property and they held frequent meetings at the site for the next two years. However, a bad storm in February 1938 damaged the concrete pump house at the resort and all record of the resort and the Townsend Society disappears from public records. In January 1940, the property was seized by the Peoples Savings Bank. Albert died six months later from an extended illness. Happy Land (1911) – At least ten tracts, apparently along Lompico Creek, although probably just south of its confluence with Zayante Creek. Lompico (1925) – Nineteen tracts proposed along Lompico Creek, but many parcels were located on functionally unusable land. Zayante Lakes (1925) – Three tracts in the vicinity of the Zayante Creek Market & Deli. Our Ranch (1926) – One tract proposed but abandoned between Olympia and Eccles stations just to the west of the railroad tracks. As has been seen above, the Great Depression contributed tremendously to the downfall of the resorts in the Zayante Creek basin since people could no longer afford to travel. Also, the industrial quarrying of the sandhills above Olympia and further to the south likely contributed to excess noise pollution in the valley. But the final death knell was the closure of the route to San Jose in 1940, which prompted the end of passenger service along the line, followed quickly by the start of World War II, which limited resources such as oil and automobile manufacturing ergo long-distant travelling. 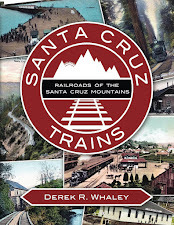 Dependence on the automobile locally after World War II meant that people took weekend and day trips to Santa Cruz rather than month-long vacations as before the Depression. Small resorts such as those in Olympia simply had too little to offer. The persistence of some of these resorts was as due in large part to their use by specific organizations and a general post-war desire to travel. By the mid-1950s, though, even those features dried up. With the exception of Mount Hermon and Camp MayMac, there are no longer any notable resorts in the Zayante Creek basin. Santa Cruz Sentinel, Evening Sentinel, and Weekly Sentinel. 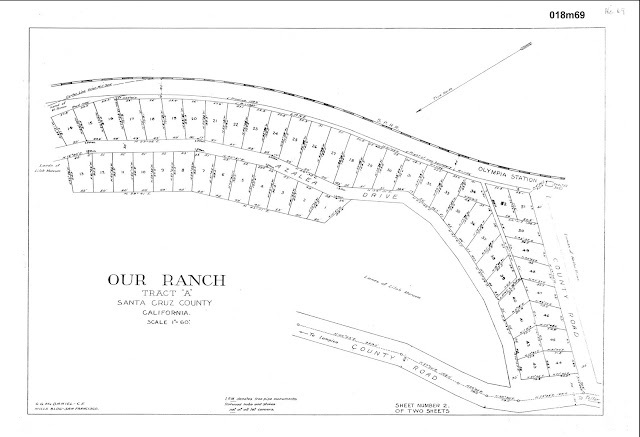 HappyLand subdivisions were north of the Lompico Subdivisions, on both sides of the Zayante Creek canyon, not near the junction of Lompico and Zayante Creeks. Another "unbuildable" subdivision in the same area as Happyland was Camp Minnehaha Subdivision. Only a very few cabins are on on these lands. It is rumored that lots were given away with theater tickets and newspaper subscriptions after the subdivisions were recorded. Many of these lots have been sold and resold and tax due sales. Most lots cannot be identified without an extremely expensive land survey, since the original maps were not records of survey. The county used to buy them up at tax sales for peanuts, and then give them to the Lompico Water District, in the 1970s and 1980s. I believe that the Camp Wasibo site is the same as the current Camp MayMac site.